Established in 1986, Blackhead Quarries Limited is a joint venture between Palmer & Son Ltd (founded 1880) and Fulton Hogan Ltd, with operating quarries in the Dunedin region. Opened in the 1950s, the company’s aptly named main facility Blackhead Quarry is located at Blackhead on the seaward side of Green Island. It produces some 300,000 tonnes per year of crushed aggregate, including base course, sealing chip, asphalt dust, and railway ballast. The rock quarried in the Otago area is a heavy, fine-grained rock that is hard, brittle, and abrasive. The company also operates quarries at Logan Point, in Dunedin, and Balclutha as well as the Walton Park sand plant in Fairfield. 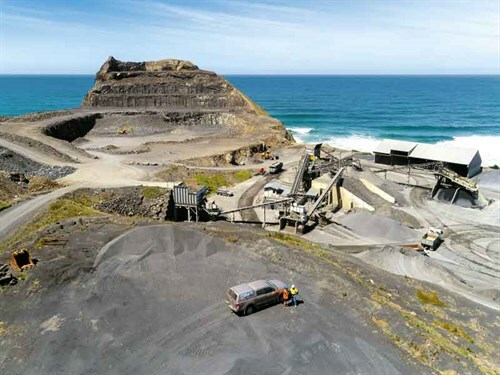 The Balclutha quarry, located approximately 80km south-west of Dunedin, is said to be the largest producer of quality aggregates in the South Otago area and supplies around 30 different products. Blackhead Quarries has extensive experience with Metso equipment, having bought its first Lokotrack mobile impact crusher back in 2005. However, its relationship with the brand extends back much longer with its original fixed plant. Blackhead Quarries general manager Tony Hunter says that being near the sea, the quarry’s fixed plant, which had been in place for more than 30 years, was suffering from corrosion issues. Management was worried about the safety of fixed walkways and the quarry’s 23 conveyors. "Five years ago, we decided it was best to build a whole new plant at Blackhead with only nine conveyors and no walkways," he says. In doing so, the existing equipment—Nordberg C100 jaw crusher, a cone crusher, and Barmac 9600 crusher—was relocated. The new plant was fully automated and designed to keep the amount of structural steelwork to a minimum, which led to the elimination of walkways. "For maintenance, we use cherry pickers, which give better access to the equipment than walkways and, in our opinion, are much safer for our maintenance staff," Tony says. According to Gavin Hartley, quarry manager at Blackhead quarry, the highly abrasive nature of Otago rock means crusher jaws and liners typically last about 3500 hours and Barmac tips only about 500 hours. "Bucket teeth can last anything between 800 and 2000 hours, so a reliable local supply of wear and spare parts is very important," he says. With a significant population of Metso machines in New Zealand, a comprehensive range of spare parts is available from MIMCO to support their customers, which relates directly to reducing equipment downtime. Blackhead Quarries has been growing its fleet of Metso Lokotrack mobile equipment ever since purchasing its first mobile crusher in 2005, thus gradually reducing its reliance on fixed plant. "You can’t bust a rock without energy, and even though it is fuel efficient, the mobile plant uses a lot of diesel. The machines have quite large motors to move them around as well as for processing rock," Tony says. "With our move to mobile equipment and reduction in the number of trucks, our diesel usage has remained about the same, but we no longer consume electricity in our fixed plants, so overall, our energy costs have gone down in the order of $100k per annum," he says. According to Tony, the subsequent reduction in truck usage has also delivered significant benefits with respect to staffing levels, site safety, and maintenance costs. 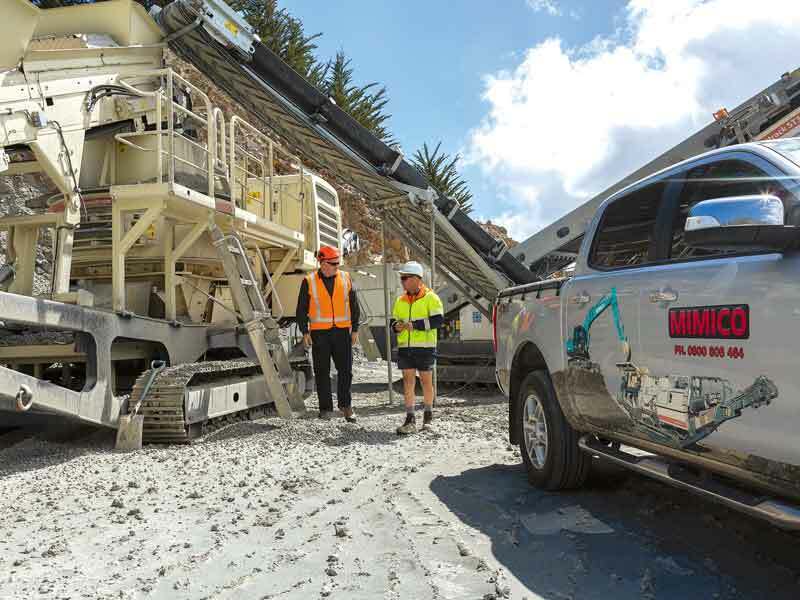 Blackhead Quarries now owns 10 Metso Lokotracks across its sites and is the largest user of these machines in New Zealand. "Our Lokotrack fleet has become very important to our business," Tony says. "Our original LT1213 unit was the first one in New Zealand and is still operating, and now we have more across our quarries. They are the core of our mobile fleet. "We bought our first Lokotrack because, at the time, it was the best machine for the job. There weren’t as many options on the market as there are today. While we are always evaluating alternatives, we keep choosing Metso because of the strength of the back-up available through MIMICO, the great track record and reliability of Metso equipment, and the quality of the product we can produce with Metso machines." The company’s Balclutha quarry makes road and construction materials as well as manufactured sand. A significant part of the quarry’s production also feeds the concrete plant next door. In July 2017, MIMICO supplied a Metso Lokotrack LT106 mobile jaw crusher along with an LT200HP mobile cone crusher and an ST3.5 mobile screen for the quarry. An additional ST3.5 and an LT7150 mobile Barmac VSI (impact) crusher were supplied in October last year. The Metso Barmac vertical impact crusher at the quarry uses an autogenous (rock-on-rock) crushing method. Its adjustable rotor speed and feed rate give operators precise control of the grade and shape of the final product. "The shape of the product is critical for our customers. If we don’t get it right, it will be rejected," Craig Upston, quarry manager at the Balclutha quarry, says. "Our Metso Barmac crusher helps us to achieve consistent product shape and quality." From his perspective, moving from fixed to mobile plant was a matter of future proofing the quarry. 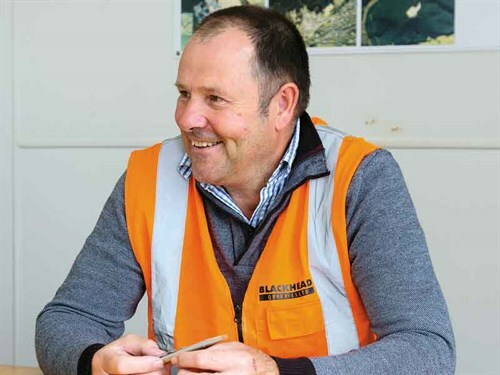 "We were planning to replace our older Barmac with a new one, and because the market for Balclutha’s product has a lot of [seasonal] ups and downs, being able to move the crusher around to different sites creates better business flexibility," he says. The quarry originally opened some distance from the town of Balclutha, but with the growth of the town bringing suburbia closer to the quarry, the issue of dust has become more of a problem. By eliminating the fixed plant that was close to the road and moving to Lokotrack machines, quarry staff can choose where the crushing occurs. The reduction of truck movement and decommissioning of the fixed plant has made it much easier for the company to manage dust. "All the mobile plant is self-powered. We don’t have any three-phase power at the new quarry face, so mobile, diesel-powered crushing and screening is the only way to go," Craig says. At a time of increasing infrastructure expenditure in the growing Otago region, being able to produce large quantities of quality aggregate in a more flexible way allows the company to be highly responsive to market fluctuations, which is important for Blackhead’s future business success. The company also deploys some of its Lokotrack mobile crushers and screens in contract crushing operations around the Dunedin area and is now looking to purchase another LT106 for a new job that will deliver half a million tonnes of aggregate for a major road building project. Technology aside, Tony Hunter sees his people as the company’s greatest asset. "There are all those buzzwords people use such as safety, productivity, and profitability, but it all comes down to people," he says. "We have a 25-year club here, comprising more than a quarter of our staff, which means a lot of experience." 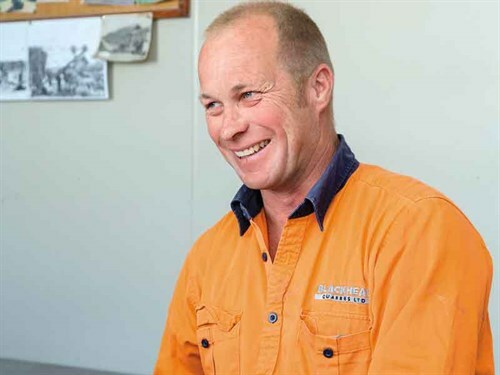 In a world where concern for the environment means that people look at mining and quarrying with an increasingly critical eye, Tony has a positive outlook on the future. "This is a simple business. You can’t have a city without stones, and so we are lucky to be a mature company in a mature local economy that will always need infrastructure," he says. "In buying the Lokotrack equipment, I am trying to set the company on a good path for whatever may happen over the next 10 to 15 years to come and beyond."